Customers love simplicity and view it as a form of good customer service. Customers hate complexity, and it deters them from buying. When you make things simple, you create a smooth customer experience. This phrase demonstrates your sense of fashion. In the customer’s mind, it shows you are forward thinking. Remember, form is often more important than function. Customers also look for ways to be and feel more beautiful, and this phrase is especially key in the fashion industry. Where you can enhance beauty, you can often eliminate a customers’ price restrictions. This phrase compliments the buyer on a decision they’ve made or one they’re about to make. It affirms their choices, making them feel good about what they’ve purchased. This is another form of “new and improved.” It communicates that the product is the latest model or the hottest on the market, triggering positive customer responses. In ad copy and everyday speech, “awesome” is the new “great” or “wonderful.” When paired with “simply” (again conveying simplicity), these words create a powerful phrase. This phrase demonstrates that you pay attention to the details. But make sure you show continuity and alignment. If you use this phrase, your store design and merchandising must be impeccable, down to the detail. Customers love to be complimented (and by complimenting customers, you increase your likeability). This phrase is a classy way of telling the customer that the product will draw attention to them. The world cares about value, but if you ask people to define “value,” they never seem to be able to do it. When you add the word “exceptional,” you help define that value in the mind of the customer. 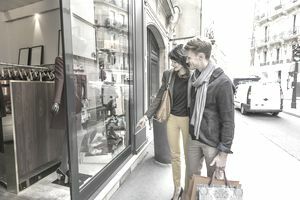 Think of retailers marked by great pride and reputation: Rolex, Coach, Tiffany & Co. This phrase helps associate your products with the kind of reputation your customers want. Tip: You can further develop these associations through your store’s visual displays and signage. This is another way of saying, “We’ve been in business for a long time because people love our products and trust us.” This phrase positions you as a valuable retailer. Again, customers liked to be affirmed in their decisions. This phrase communicates that if the customer buys your products, they will have made an excellent choice. This phrase says you’ve created an experience for customers that you want them to remember and share with others, generating word-of-mouth advertising. Think how brands like Betty Crocker have created a lifestyle in their marketing. This phrase communicates that your products create and celebrate that kind of lifestyle for the buyer. This phrase is ideal for the activewear or sports equipment industries. It creates an excitement for life and the desire to elevate the customer’s life experiences. Similar to “We Display with Pride,” this phrase positions you as a respectable, reputable resource. It works especially well if you’ve been in business for a long time. Specialty retailers’ products are often more expensive than chain stores, usually because they carry a brand’s higher quality products. This phrase acknowledges that a store’s price is higher, but in a way that demonstrates the benefit of paying more. This phrase tells customers the gift will create that wow factor. It also advertises that the product meets the desire to get what you want when you want it. Again, people want results fast. Commonly used in the energy drink industry, this phrase tells customers they don’t have to wait to feel great. How Does Cross-Selling, or Suggestive Selling, Help Your Retail Biz?